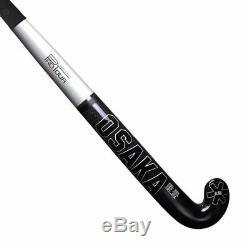 Osaka Pro Tour LTD Silver Pro Groove Composite field Hockey Stick LATEST MODEL. The Osaka Proto bow is the ultimate specialist stick, shaped to maximize the potential of FIH specifications. The maximum bow point lies at 200mm from the cross with a max height of 24mm, like the low bow. Though it has been combined with a very aggressive, slimmed down profile to ensure incredible speed and control. It is designed for the drag-flicking elite looking for low bow characteristics and ultimate control. Specs - Proto Bow - 24mm bow height - 250mm max bow position. Handle - 30mm thick - Osaka Pro Touch 2016 BLACK (buffed and perforated) - 1,5mm VibraStop foam layer. Head Construction - 45 degree angle - 115mm length - 25mm thick - Kevlar reinforcement. CONSTRUCTION - 98% carbon - 1% Kevlar Cross reinforcement - 1% Aramid Backhand Blade reinforcement. Great News / Free Stuff. We send the stick as gift. Very special discount tariff will be given on bulk order of 5 or more sticks. 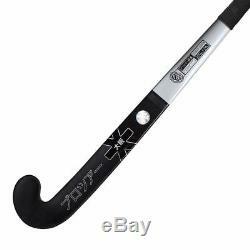 The item "Osaka Pro Tour LTD Silver Pro Composite field Hockey Stick 36.5 2017-18" is in sale since Friday, March 23, 2018.